'Life is an Adventure, or it's Nothing.' Helen Keller said that. That's always been my motto too. I'm ALWAYS up for Adventure. So when Mazda asked if I'd drive down to New Jersey to pick up a car, I jumped at the opportunity. Ten uninterrupted hours of driving, getting to listen to my book - wonderful! I just love getting to drive for Mazda - it's the only way I'll ever get to drive a brand new car. Zoom zoom. Now, living with the sense of Adventure, as I do - always ready, willing and able to do anything & everything, I figured that I had learned some stuff. Like 'TRAVEL LIGHT'. We really don't need half the stuff that we drag along with us on any given trip. We need far less than we think we do. Getting away from all the accumulated 'stuff' that surrounds us leaves room to allow the new & fresh into our space & time. So, off I went yesterday, with particularly little, figuring that I'd just be driving all day & turning around & driving right back. As it turns out, the vehicle that I'm bringing back isn't ready - not even sure at this point when it will be. I hadn't factored that possibility into the equation. So ... revised 'Life Lesson' about travelling light. Perhaps not quite THAT light. I have no book to read, to put in time & the batteries for my audio book are just about dead. I have no 'work' to do - like needle felting or the zillion other things that I could be/should be doing. And I have no decent shoes, so I can't even go for a walk. Since I figured that I wouldn't really be getting out of the car much, I only wore those goofy flip flop things. Here I am - ten miles out of New York City, perhaps with a day that I really could go on an awesome adventure & I have no decent shoes. They do sell books too. And as far as 'work' goes - give my head a shake - that would just be downright silly. I am having an Adventure. Premature. That's the only way that I can explain it. Maybe it was the full moon that caused Katie to go into labour a whole twelve hours early. At any rate, he missed the mark. If he would have had the good grace to wait just a little while longer, he would have been born on my birthday - which is the expectation in keeping with our Special Day Arrival record. 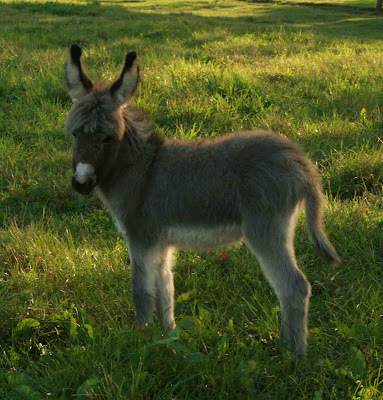 He wouldn't have been the first donkey to arrive on my birth date. I guess he just didn't want to share his day with another Jackass. Or as it were, two. He arrived in all his fuzzy glory on Sunday, August 2nd ... the second birth that I've missed this year while I was in Newfoundland. 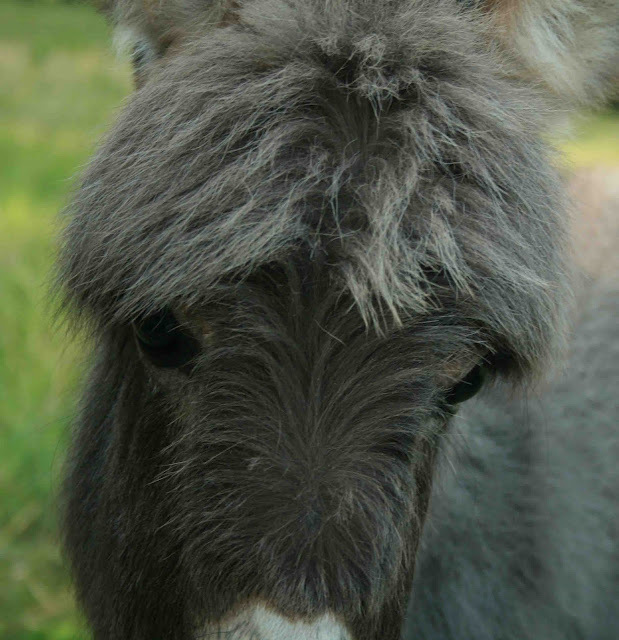 He's darling & sweet & tiny - and unusually furry for a mid-summer baby. I think I'm going to have to call him 'Mister Mark' - because he did. 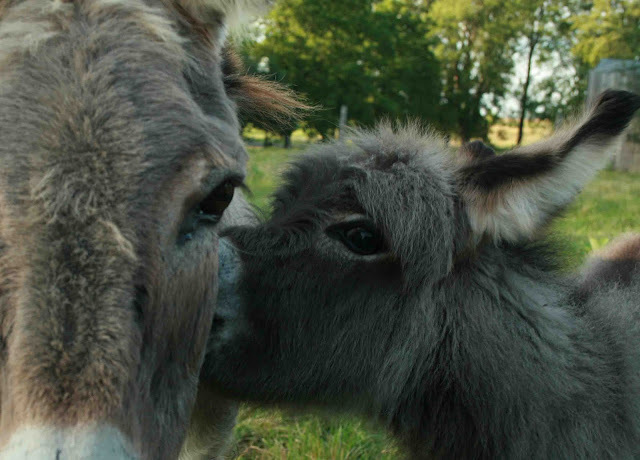 Pete, Cole & Mark ... my Three Donkey-sons. When people ask Brian what he does at our place in Newfoundland, his answer is: "There's nothing to do, and you won't get it done." Indeed, the day seems to fill itself without pre-planning. It 'unfolds'. Often, as the gals who come out during 'Summer Chick Time' will attest, a 'quick trip' to town will become a full day's journey which takes us to unexpected places & lasts well into the night. At all times, we are prepared and open to adventure & possibility - keeping a variety of footwear and clothing in our 'mobile closet' (my van). 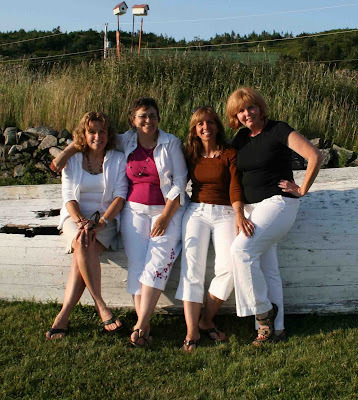 My first companions were my sister, her friend and my aunt. 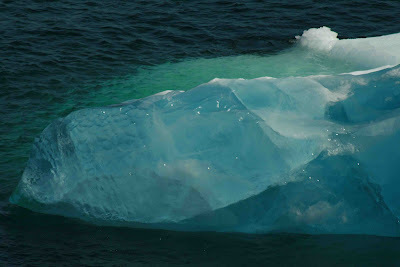 We were delighted to see lots & lots of icebergs still around which stayed until July 28th. The 'Fun, Fish, Folk Festival' was on, so we attended a multitude of parties & concerts - usually having to hit three or more events on a single day. We started each morning with coffee on the porch of Oz, and enjoyed some wonderful'sharing circles' in a candle lit Oz. It was quite rare for us to be in bed before 2 am. We partied, we fished, we sang, we 'mummered'. 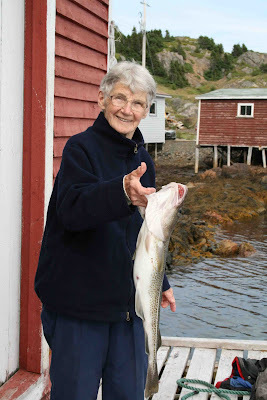 At 92 years old, my amazing & incredible aunt caught her first cod fish & got 'screeched-in', becoming an honourary Newfie. I too caught my first cod. I generally leave the fishing to everyone else, under the guise of allowing my visitors to have the experience because I'm there more often. The truth is more in the fact that, although I loves to eat them, I'm not a fan of taking their little lives. I'm the monitor in the boat who says: "That one is SO little - he should go back so he can grow up." or "That one is SO big - he should go back because he's avoided being captured all this time." Six summers & this is the first time that I actually caught & kept a fish. TWO in fact, which we proceeded to turn into our fifth meal in a row of fish chowder. 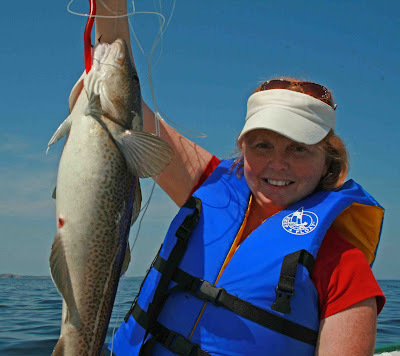 It was a huge deal to get to be there during the 'food fishery' - we did not miss a single day of enjoying the succulent, mouth watering treasure of the sea, caught right out there in our backyard. 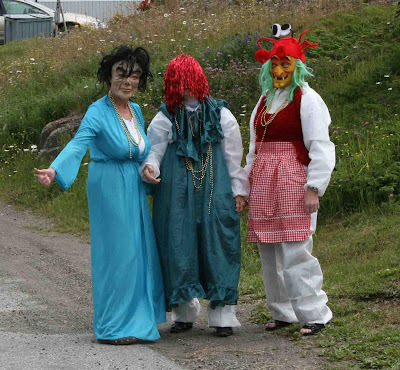 My second set of visitors were three of my Sistas in Creativity & Adventure. We too, filled our days with concerts, visiting, fishing and beach combing. We started with being invited out to breakfast on the very first morning. The hydro must have gone out during the night as the clocks were blinking in confusion. We got the time from Pauline's cell phone & added the required hour and a half, rousting the other two so we wouldn't be late for our 9 am date. As we headed off, the van clock indicated it was 7:35 am, but since we were dressed & ready we chose not to believe it. Turns out it was accurate & we learned that a cell phone automatically changes with the time zone. We also learned that good friends with a sense of humour will still welcome you with a hug & laugh when you get them out of bed an hour and a half early. Oh yes, we shared many laughs and many memorable moments. We celebrated my birthday on 'the edge of the world' ... Brimstone Head, Fogo Island - one of the designated 'four corners of the earth'. 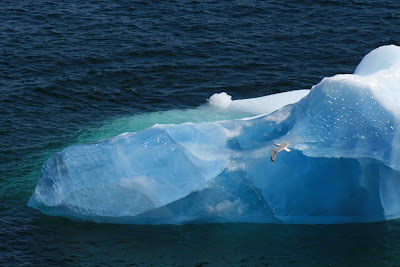 We saw whales & carribou, we had a 'Hen Party', we made new discoveries & new friends. We released ourselves from the rest of the world - no television, no radio, no newspaper, no internet, no cares. Oh how I wish that every soul could have such an opportunity to be refreshed & renewed with 'Rock Therapy'.